Creativity in general? Mandatory! You have to be contributing something. That’s Rachel’s opinion. Do you agree? What is creativity to you? How about getting creative by participating in this transmedia documentary? In episode 14 Margaret, Rachel and Tina talk about the ways they are creative, how it changed in ten years, how at least one pretended to not be a punk rocker anymore and how all of this is influencing their children. This is a transmedia documentary, so we want to hear from YOU. Share your opinions and experiences via video response or comment. 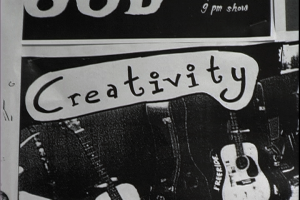 To get you started: How important is creativity to you? If it is important, how are you creative? This episode really speaks to me. I grew up in a family that encouraged each and every creative pursuit I had, and I am creative in some way every day. I played music for over a decade, and I haven’t picked up an instrument in over a decade and I miss it terribly. Instead, though, I took up fiber arts and mixed media arts (maybe because it’s easier to sew something in a tiny New York flat than blast away on a saxophone or move a piano up four flights of a walk-up?). The struggle for me, as I’m sure it is for many creative types, is not letting things intrude into the space that’s needed for creativity and for making that space. I’m lucky enough that my job is 80% creative, but that means I also need to make some sort of art for myself as often as possible – something that isn’t job related and just for me, for “fun”. And sometimes living life and trying to make a living from creative stuff is a little bit like a mixed martial arts fight. Granted, these are issues I’m lucky to have, but it’s a struggle. If there’s not some sort of glue on my hands or ink smudges on my fingers, I feel like I’ve wasted the day.